When I woke up this morning, I found myself caught in a cold misty cloud. This us pretty normal on Mt Hood and I was hopeful that it would lift or I’d be able to home above it. Thankfully, I was able to hike above it and the view was pretty cool. 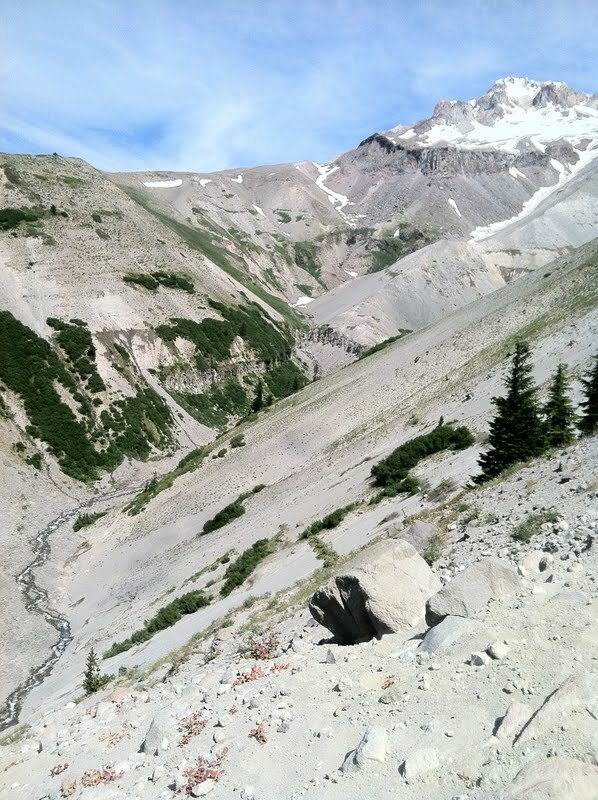 I had forgotten how steep, sandy, and tiring the hike up to Timberline Lodge was. I was also taking video and pictures and was worried I’d be late for meeting my stepmom, Robin. When I turned the final corner to the lodge, I saw Robin hurrying over to the trail to sit on a rock with a sign. As I approached, this is what I saw. 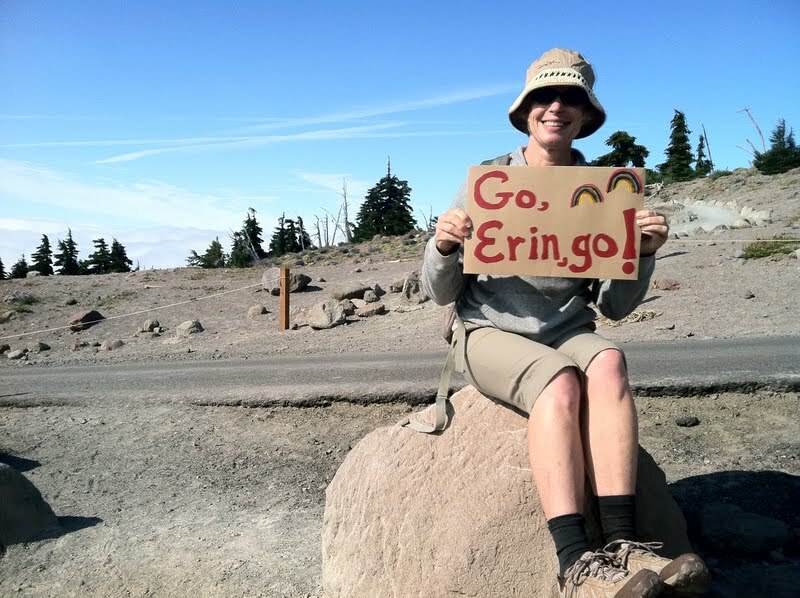 One of my friends started this slogan and I’ve been getting great pictures from friends of them holding a sign that says, “Go Erin Go!” Robin even added a double rainbow for my double rainbow moments! It was great to get a brief break at the lodge. 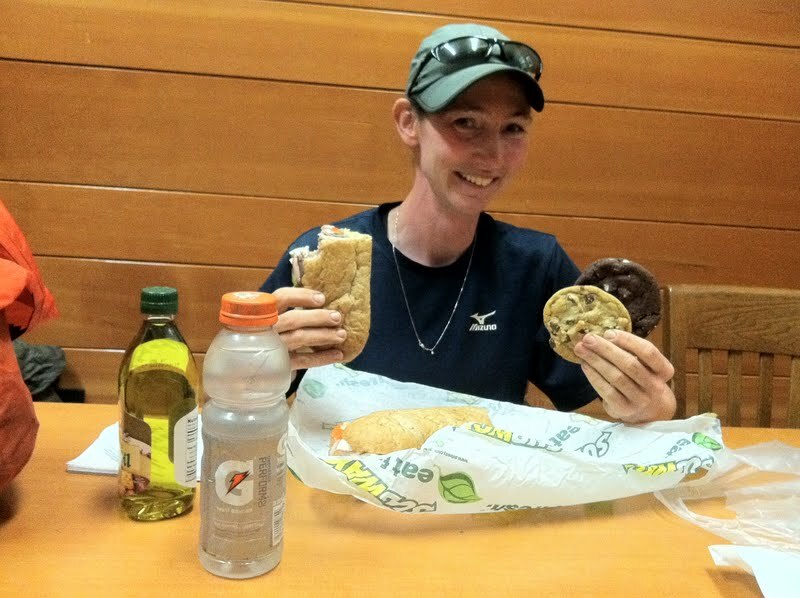 Robin even brought me Subway. Mmmm! I chose not to do the popular Timberline buffet because it was pricey and my stomach has gotten used to many small meals instead of one large one. I just wouldn’t have eaten enough to make it worth the price. While we were there we saw Sly and Pounder. Sly pointed out that we could make it to Cascade Locks by tomorrow night and I decided I’d push to do that so I could get one more night at home. Totally worth it! Sly left a couple hours before me and Pounder left after me. I tried to encourage Pounder to catch up to me and also get to Cascade earlier. He was going to see how he did after the big buffet and maybe catch me later. Robin hiked out with me a few miles and that was fun. It’s been real nice to have people come visit along the trail. 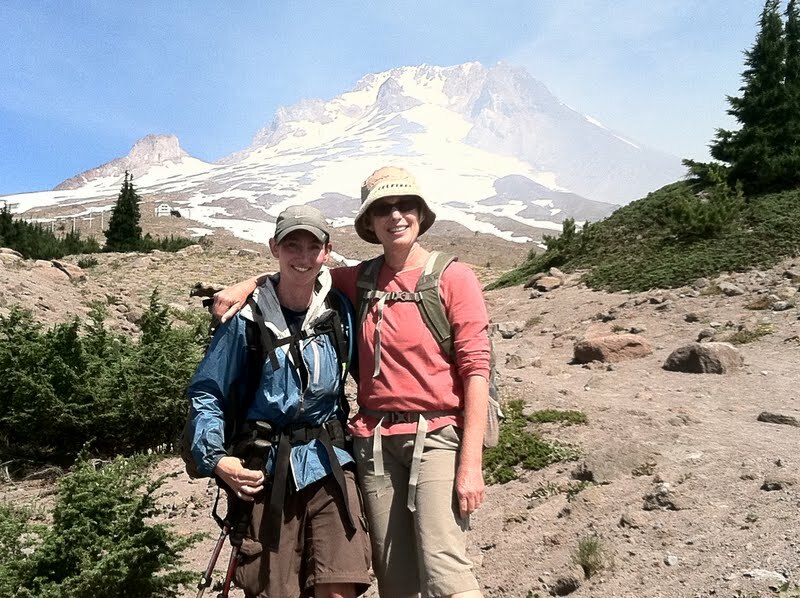 Here we are with Mt Hood behind us. After she left, I tried to push in as many miles as I could before dark so I would have a shorter day tomorrow. I had a couple directional mishaps and that ate up some time. Plus, there were cool views to take pictures of. Then I had to decide if I had time to do the popular Ramona Falls side trip. I’ve done it many times and decided I should do it so my followers can see it. Long story short, I took the wrong trail that took forever and coming toward me, I ran into some hikers I had passed a half hour earlier who did the loop correctly. They said I was still another mile away and I decided I didn’t have enough time because I was already behind on my schedule. Sorry everyone. No picture of Ramona Falls, but I tried. The hikers mentioned that someone up there had just seen Pounder and there are many connecting trails, so he may have taken one of those. I pushed on to do one final steep climb before dark. I hoped to find a flat spot to camp at a trail intersection at the top. It turns out there was, and I was happy to also see a couple of hikers also camped there who were doing the loop around Mt Hood. They said Pounder had just walked off and we tried to yell for him. I hope he didn’t have to hike much further because the contours on the map were pretty steep for a few miles. My plan is to get up early tomorrow to get to Cascade Locks in time for my dad and Robin to pick me up. I’ll probably pass Pounder’s tent in the morning and leave him a note. It is quite cold tonight and we could see our breath when we talked. There is a possibility of stormy weather tonight and some thunder has started in the distance. The hikers, Bill and Linda, were very kind and friendly. They had to turn around today because there is a fire on the other side kf the mountain. I thought Mt Hood had fog this morning and Robin pointed out that there were a couple of fires on the east side. It was fun to talk to Linda and she even offered to host me at her cabin north of White Pass in Washington. It will be cool if the timing works out. We’ll see. 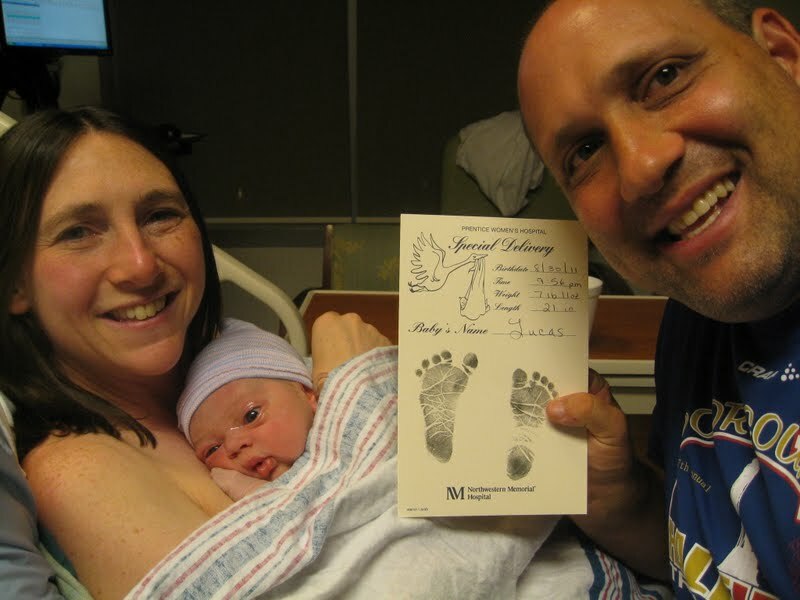 Also, on this eventful day, my twin sister had her baby! I had reception the first half of the day and was bummed to lose it the rest of the day just as she was getting closer to pushing. I can’t wait to get the picture tomorrow and Skype while I’m in Portland. Perfect timing! Here is the picture I got the next day. Congrats Siobhan & Randy. Welcome to the family Little Lucas!! !